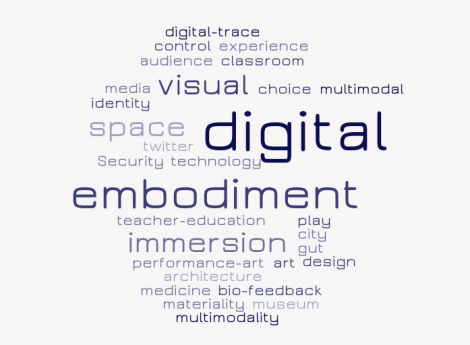 The mode seminar on embodiment and digital technologies (03.04.14) drew an interesting interdisciplinary group together. The word cloud made from the three key words that each of the participants used to introduce themselves shows something of this mix. As one of the participants commented, embodiment draws together people from across a wide range of disciplines – at this particular event from sociology, art, performance, psychology, media and communication studies, literacy and education studies, human computer interaction, design, and architecture. This entry was posted in Events, Research and tagged embodiment, research, technology. Bookmark the permalink. Many thanks to Dr Trevor Wiggins for passing this on. As the deadline for SEM 2014 approaches, I am putting together a panel of paper presentations that deal with intersectionality studies in ethnomusicology with an emphasis on dance and musical movement and video that allows us to discuss issues of race, gender, sexuality and desire (among other things) in ethnographic research on and off-line. Papers will include one by Ari Ben Mosha Gagné (Univ. of Colorado at Boulder) looking at twerking, booty-shaking and p-poppin among women as well as men in bounce music culture. I will be presenting on research on black girls twerking on YouTube, research I introduced in my SEM 2013 presentation (thanks for all who attended). I am currently writing about my research on my blog http://kyraocity.wordpress.com. The panel will also focus attention on the technologies of the musical body in the study of systems of oppression and/or social change relative to self-presentation and the generalized other from a sociological perspective. Presenters are strongly encouraged to use video or actual live dancing. This is envisioned as a panel akin to the queering the pitch discourse that embraces intersectionalism in ethnomusicological studies. If you think your work fits, send it for consideration to kyraocity@gmail.com. Digital ethnomusicology studies are strongly encouraged. Must hear from you by Jan 31 to prepare the proposals for submission. This entry was posted in Events and tagged body, ethnomusicology, research. Bookmark the permalink. This two-day symposium will explore issues surrounding Performance, the Body and Time in the 21st century. How is the ever-increasing pace of technology generation affecting us as artists and audiences? How have the advances made in the 21st century changed the way we create, the way we consume and how we collaborate? The premier exist conference will take place 26- 27 June. It will be held at the Queensland College of Art – Project Gallery, Brisbane. The Queensland College of Art, established in 1881, is one of Australia’s longest-running art and design colleges and is situated at Brisbane’s South Bank. Conference proceedings will be produced and published online. Abstract proposals (up to 500 words) should be submitted with authors’ details provided separately, so that submissions can be reviewed, blind, by a Conference Review Panel. Please send your proposal as a Word document attached to an email addressed to exist@live.com.au with subject exist-symposia. Please ensure that your email includes your full name, affiliation, address, email address and phone number (Please DO NOT INCLUDE THESE DETAILS WITH YOUR ABSTRACT). DEADLINE FOR SUBMISSION: 8th April 2013. The Conference Review Panel aims to complete the review process by 30th April 2013. This entry was posted in Events and tagged gender, mediation, performance, research, time. Bookmark the permalink. The Summer Symposium 2012 is the final of six meetings in the Study Circle 7: “Artistic Research – Strategies for Embodiment”, organized by the Nordic Summer University (NSU). The study circle invites researchers and artists from all fields to take part in discussions on the theme: Strategies for Embodiment within Artistic Research; questioning and probing ways of embodying and communicating artistic research processes and their outcomes. The theme for this, the third year of our study circle, is writing and dissemination. The focus will be on language and discourse, and the development of strategies for writing and disseminating the experiences drawn from the field of Artistic Research. As a rapidly evolving discipline Artistic Research is the site of ongoing epistemological debate regarding the foundation, scope and validity of the knowledge it uncovers and creates and the mechanisms by which it embodies such knowledge. This symposium will address the issue of writing about this knowledge. In order to advance the debate, we will focus on notions of embodiment as they have emerged in our discussions to date and also with regard to the proposals received in response to this call. At the Winter Symposium 2012 it was agreed that the theme for our Summer Session 2012 would be: writing about artistic research and artistic research on writing. For the Summer Symposium we welcome proposals for presentations of artistic research on writing in various formats, ranging from demonstrations and presentations/excerpts of artistic work, to theoretical reflections in the form of short papers and suggestions for panel discussions. – Anthology session. Session based on a draft of the article for the anthology. Please specify which of the above formats you wish to use in your proposal. – The 5 min presentation followed by a 25 min discussion is appropriate where material has been distributed beforehand. This may include regular papers but also material from work in progress, for example posters, drawings, sound, film, other textual material etc. We will accept papers of maximum 4000 words, these papers may be drafts or work in progress. Text and drawings must be sent in PDF or JPG format. Sound and film material must be accessible through a web link. Please note that there will be a deadline for pre-distributed material and articles. – The 15 min presentation is a free format for any kind of presentation: performance, paper or other. It will be followed by 15 min for discussions. – The 40min. + 20min. is exclusively for practical work like panel discussions, performances, workshops, work-in-progress, showings etc. – Presenters may also propose one to three short quotations (distributed to the other participants in advance) as a starting point for a discussion and or a process of reflecting on theory. – We welcome proposals for poster presentations. You are welcome to use additional materials such as images, audiovisual footage or whatever is relevant to your work. The length of the proposals should be no more than 350 words, plus a short CV, (or just a short CV if you intend to participate without presenting). 1. In which format(s) you wish to present. 2. What facilities you need, i.e. what kind of equipment, space etc. 3. The language of your presentation. Presentations may be either in a Scandinavian language or in English. Please consider that there are participants who may not speak a Scandinavian languages. Presentations in English will be favored. The extended deadline for proposals is 15th June 2012. You can find out more at www.nsuweb.net. This entry was posted in Events and tagged arts, embodiment, research, writing. Bookmark the permalink.